“Some say watercolour is difficult to do. I disagree. It has been used by young children to seniors for long time. 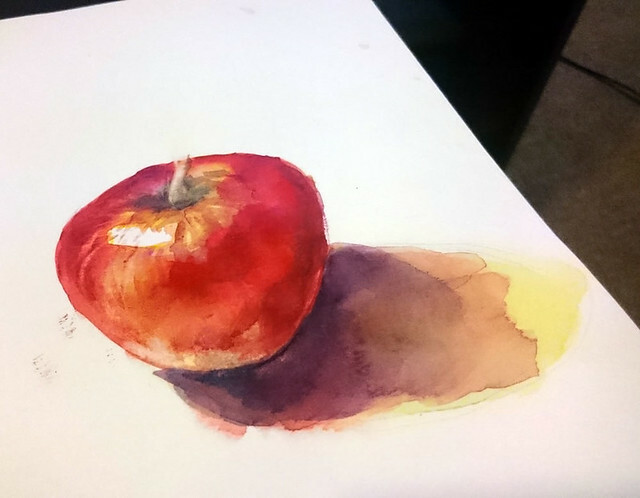 Drawing and painting an apple. To me painting with watercolour is like a cooking. Mixing water and pigments, placing the mixed colour liquid on paper (wet paper / dry paper), waiting for drying, and placing another mixed colour liquid on it …. The procedure can be taught to the point according to the recipe, but this is something you need to do it repeatedly until you really get how it works. No short cuts. In the workshop, you will draw an apple with 2B pencil then paint/draw with artist quality watercolour which is my selection of 6 colours. 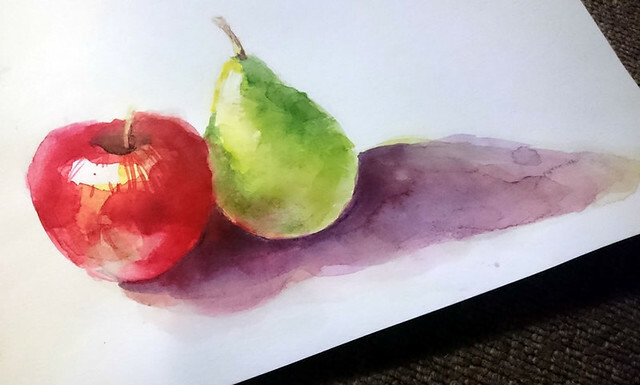 The recipe (draw/paint an apple) appears to be simple but you will learn so many things along the way. I hope the experience at the workshop will set you off on your watercolour painting journey. those who haven’t done watercolour for a long time but would like to start again. those who are not sure watercolour is for them, would like to have a whole experience before spending some money on art materials. Studying the shape of an apple. How to set the lighting onto an apple. Demonstration by Ako: Drawing & painting an apple. Drawing an apple with 2B Pencil: See the shape, the value and the edge. Painting with watercolour: Wet in wet (Light & Vivid colours), Dry completely, Wet on Dry (thicker & darker paint), Negative painting, and Glazing. 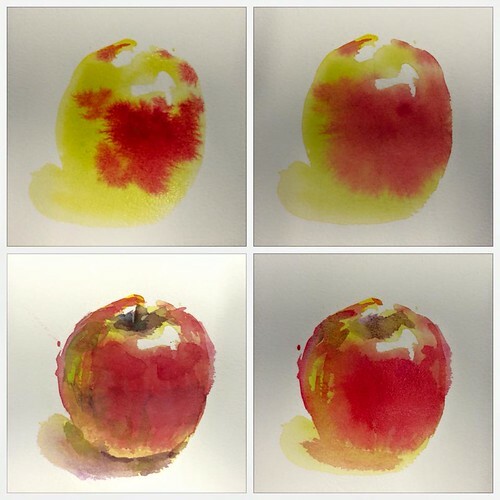 Painting an apple with watercolour without a pencil drawing. All art materials which will be used in the workshop will be supplied. However, you are wecome to bring your own art materials (I can give you some advise about them). Also, A set of art materials can be purchased after the workshop which will cost around $150. Please let me know beforehand if you are interested in purchasing them, I will make sure of having enough stock on the day. 6x artist quality watercolour 15ml tube: Ako’s selection of basic colours from Daniel Smith and Schmincke. $150 per workshop per student. *All art materials will be supplied.